Images from East London showing the destruction from German bombs during World War Two. Images scanned from a genuine copy of The London Evening news magazine, handed down to me from my grandfather. Founded in 675, it is one of the oldest churches in London. 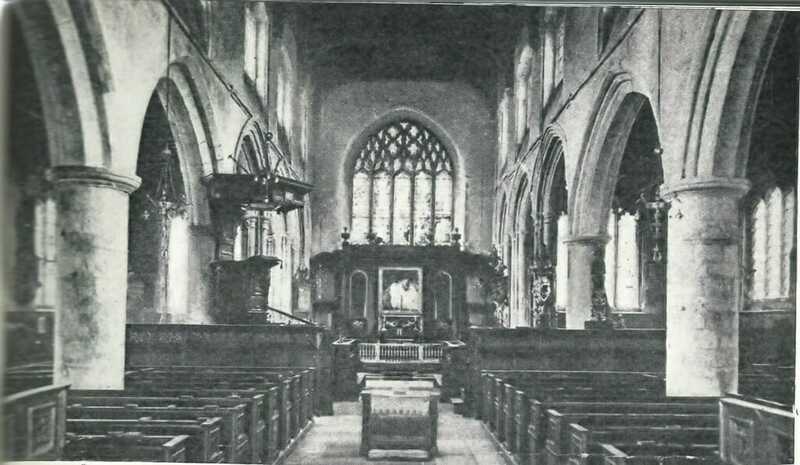 Toc H church, All Hallows Barking was blasted by German bombs in December 1940 and three weeks later was completely burned out. It was one of the most complete mediaeval churches. When the ruins were cleared parts of an 11th century cross were found, also an arch belonging to the original Saxon church. All Hallows survived the devastating explosion in a neighbouring ship chandler’s shop in 1649, when 27 barrels of gunpowder exploded. Sixty houses went up and 67 people were killed. Hi Last week you published an item ,re v2 hit on Wren rd by a guy who lived there,I was 7years old at the time,living in Fitzstephens rd, in view of a Wren rd .I awoke to the blast ,my bed was under the front window was covered in glass as luck would have it,my head was next to the wall,so sheltered,our front door was blown in and roof tile damage.I can still remember calling out ,was it time for school,but don’t think I went that day.We went to see the damage and remember a bed hanging from the remains of a wall,weeks after we played in the damage,building brick dens .Out of interest one of my playmates was Michael Nicholson the top ITV war reporter who lived in the same road.I never found out full details of damage,but as I am in Aussie,I cannot get to Valance house in Dagenhamto to look up the records ,While I was evacuated to Salcombe in 1941,houses at end of our garden in Ilchester rd were bombed leaving a field. Later on in mid 43 ,FW19O F/Bombers hit Marlborough rd and Peartree gardens killing 15,as my school Erkenwald always had damage up till 1952 ,it must have been done in the 1943 raid as the three hits were 2OOyards apart with the school in the middle,but could never find out,the damage was a 5Ofoot gap between the girls and boys school. I should have asked these questions when my parents were alive but now I’ve reached 80 I realise what dangers we faced then. Thank you so much for your story. I speak for everyone here in saying that we all enjoy hearing stories from people who lived through the history! Re Valence House please try [email protected] who might be able to help you. I to went to Erkenwald school leaving in 1974. I remember taking part in a pageant celebrating All Hallows by the Tower’s place in history. The star of the show was Max Bygraves’ son Anthony. I was living in the TOC H hostel ‘Talbot House’s next door to Tower Hill Underground Station. My girlfriend Lisa also took part. I played a mediaeval knight. My girlfriend had left her handbag in the hostel. She asked if I would fetch it for her. I walked across Trinity Square in my costume, during rush hour when it was packed. Not one head turned to stare at the mediaeval knight passing them.